Many of the ‘modern’ creamers (and teapots, and pitchers, etc) have stickers or marks which identify their makers, and I’ve tried to identify them in the appropriate theme section. Here I’m featuring just a few factories or brands, selected either because I have quite a number of their cows in my collection, or because their brand names are quite well known, or just because I personally find them pretty special. There are two makers or cow creamers that I like best of all. The first of these is Goebel of (West) Germany, perhaps best known for their Hummel figurines (yes, I have some Hummels --inherited from my Grandmother -- but they don’t pass muster for this collection). Goebel seems to have made quite a number of cow creamers and pitchers over the years (they bear a number of different Goebel marks, from the Crown through various bees), some realistic, others fanciful. 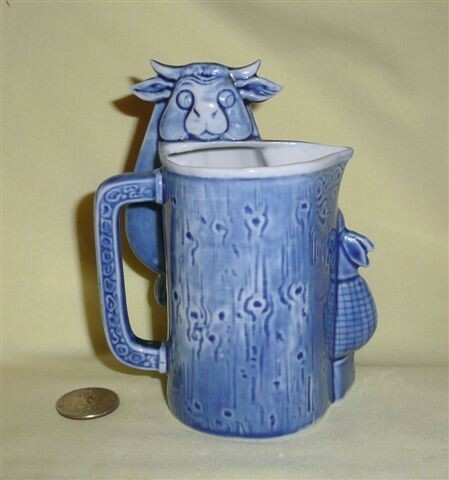 I would hope that some serious Goebel collector can perhaps tell me how many cow creamers and pitchers they have actually produced – I’ve tried the web and a number of books, but without success. As a remionder, click on any of the thumbnails to get a larger picture. 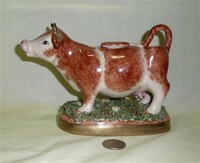 From the number of these that come available on eBay, they seem to be the most common of the Goebel cow creamers. The smaller version of the standing creamer has a matching sugar bowl, but I’ve never found one for the larger creamer. This model has also been used fairly widely for souvenirs. These Goebel caricatures of a cow with a large back opening and outsized udder (must be uncomfortable) are also fairly common, and were popular as a souvenir…at least at Niagara Falls. They all bear the Large V bee, used by Goebel from 1950-1955. The two with brown spots also say “Germany” which implies they were made for sale in the US, which requires country of origin markings. The matte white one has the Goebel mark on a hoof along with “Foreign”. That term was initially used for German products sold in the UK after WWI, but this one is too modern for that so I don’t know the reason for the designation. Maybe again UK though, since there was unlikely to be much love for German products there for quite some time after WWII. Many of the Goebel creamers have apparently been copied by other manufacturers. The smaller of the brown and white ones in the first picture has many close ‘relatives’, and I have a couple of the outsized-udder ones that are unmarked and quite similar to the Goebels. Here’s another example – the one on the left is marked for “Goebel, W. Germany” and came to me from an eBay seller in the UK. I bought the other two on a trip to Germany; the middle one is marked “Made in W. Germany”, and the one on the right – that has some extra ceramic on the neck – is unmarked. The ‘original’ has the horns and ears separated while they’re merged in the copies. Here’s another of those large-uddered creamers (this one without a bell), next to an early and rather wild green Goebel cow pitcher, along with their marks. The green guy is a bit scarred, but he’s the only one I’ve ever seen in that color; apparently they came in red as well, and perhaps other colors (??). The red one is sitting next to a Goebel cow-head pitcher. 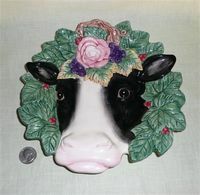 Here’s another fanciful Goebel representation, a cow head on a barrel; and a lovely small realistic black and white creamer. Here’s another early realistic Goebel creamer, bearing the incised Crown mark; as well as the letter “S” and the mold mark “465” over “3”. These two appear very similar and also bear the Crown mark, but the larger has the initials “Z.V.”, and the smaller one has a mold mark that I believe to be “473”. Three more, with the crown mark, displaying the differences in size and coloration of this style mold. Goebel was founded in 1871, and its first porcelain factory was opened in 1878 in Oeslau-Rödental, in the Coburg district of Bavaria. Following the end of WWII, this area became part of the US Zone of Germany – as this interesting stamp on one of the more popular Goebel cow creamers testifies. and here are a couple matte white ones, both with the stamped full V-bee mark; the one with the bell has the mark on the bottom of the left front hoof, which is unusual since brand marks are usually on the belly as is the case with the one without a bell (and less distinct mold impressions). It also has a circle with “Foreign” inside, making me think it was a British import. Here is another white "Goebel, W. Germany" creamer, from a slightly different mold, and glazed. 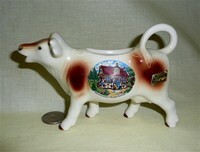 The Goebel cow creamers appear to be, or at least have been, popular as souvenirs in Germany. Here are a white one with a sticker for Goebel that’s displaying “Grus aus dem Schwartzwald”, and a brown and white one with the small V-bee symbol – similar to but smaller than the ones in the first picture – that shows Hansel and Gretel in “Marchenhain-Niederhimbach”. This one also sports a gold and black sticker on left flank for “E&A, Böckling, Neudenau”. Finally for the Goebel part of the collection, here’s a beautifully crafted kneeling creamer bearing what’s known as the double crown mark: an incised “wide crown WG” which was in use from 1935-1945, also “S” and “471/2”, plus a green stamp with the same wide crown WG mark. Schafer and Vater is my other favorite brand. Gustav Schafer and Gunther Vater founded their factory in Volkstedt Rudolstadt, Thuringa, Germany in 1890, to produce high quality porcelain. In 1896 they purchased the List Porcelain Factory at Neuhaus, and by 1910 Sears Roebuck Company began to import and distribute Schafer & Vater pottery into the US. In 1913 Paul Schafer took over from his father and, working alongside Gunther Vater, built up a successful workforce of around 200 people, using 3 kilns. In 1918 the factory was destroyed by fire and they set up a new factory to resume production. I have been told by a knowledgeable S&V collector that after this time they made only utilitarian items, so presumably all my fanciful animal creamers came from the first factory, and likely were made prior to WWI. The firm closed in 1962, and it’s believed that the East German government assumed control of the vacant factory in 1972, and all records and molds were destroyed. Schafer & Vater are well-known for comical and figural items, as well as jugs, creamers, miniature liquor bottles for distribution by pubs, special advertising runs for clients, figurines, match strikers, hair holders, “naughties”, hat pin holders, and planters. Their impressed mark is a crown above an 'R' in a star, although it wasn’t always used and frequently is indistinct. A characteristic of their pottery is the fine texture of the locally mined clay that was rich in kaolin and yielded pottery with velvety texture and very fine grain. There are a number of S&V collectors featured on the web. I have stayed strictly with their dressed-up animal creamers, but I like their work so much that I have succumbed to a number of their other animals in addition to cows, as you will see. 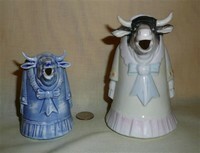 This standing lady in the yellow and pink dress is perhaps the most commonly available S&V cow creamer. S&V often made their products in multiple sizes and colors, and from what I have seen they frequently produced blue and white as well as colored versions of their creamers. 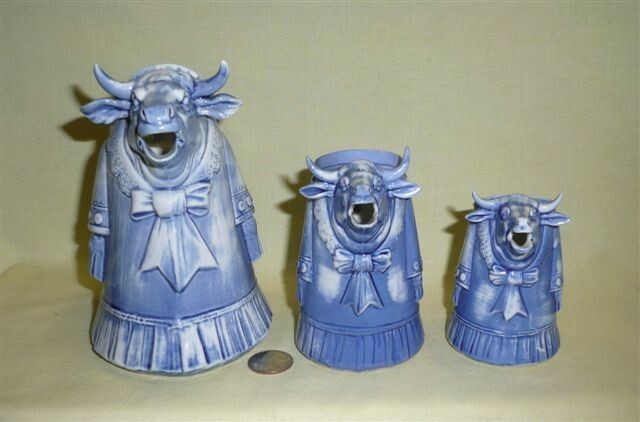 These three lovely well dressed blue lady cows are a good example of S&V’s size variations. The largest is 6¼” tall, the middle one 4½”, and the small one 3¾”. And who knows – there may yet be more lurking out there waiting to join my herd. 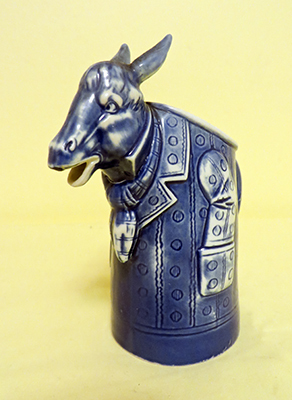 Here’s a second version of an S&V cow creamer, nattily dressed in a red coat with green pants…and its blue counterpart. I also have a smaller version of the colored one. 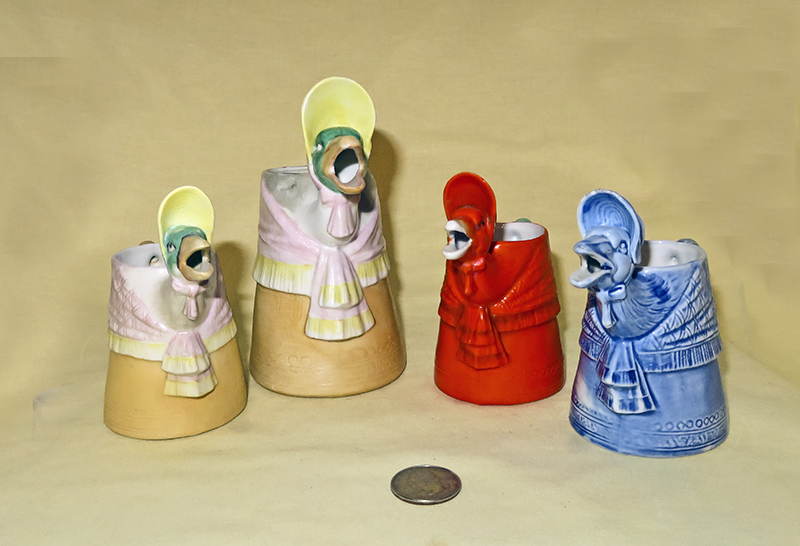 These creamers (at least the two on the right), although unmarked, are almost assuredly S&V virtue of style, material, detail such as on the skirt, finding one on eBay that was offered from an estate of someone who collected only S&V, and there being a blue as well as colored version. They do have illegible numbers around the base. The one on the left is a heavier ceramic, not porcelain, and lacks the fine features of the other two. A very knowledgeable S&V expert, Cody (Al McQueen) was kind enough to suggest that it is probably from the same area (Rudolstadt) since many factories made similar items and artists moved around. He also noted that S&V stopped making figural novelties like these shortly after WW1, and from then until they closed in the 1960s made only utilitarian forms. This certainly helps with the dating. Here are two versions of an S&V ‘pitcher’ featuring a back faced cow with an impish look on her face standing next to a winsome Scandinavian milkmaid. The smaller one came to me from Florida, and the larger – which arrived several years later – actually hailed from Sweden, which likely explains the colors of her vest. 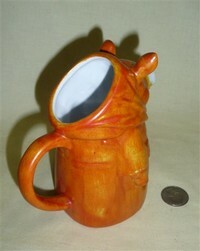 The big creamer stands some 7” tall, one of the largest of my S&V pieces. And here's another, pretty realistic looking from the side with the back of the cow and the milkmaid, but leading one to wonder exactly what the lady is doing from the look on that cow's face. I'm anxious to find a multi-colored version of this one. Eventually I did manage to find a colored version of this comical S&V cow, which I bought via eBay from Sweden. 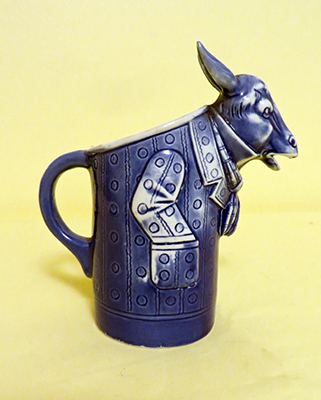 A year or so later, I was delighted to acquire a similar one – basically the same cow, but a quite different pitcher and milkmaid – this time from the Isle of Jersey! I believe these are quire rare, both because they’re the only ones I have ever seen, and because the bidding on them was quite fierce. I prevailed, but at some cost! 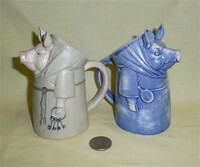 They’re great examples of the S&V sense of humor, combined with very high quality pottery. Now that I have three of these, I’m naturally wondering how many more variations there are. 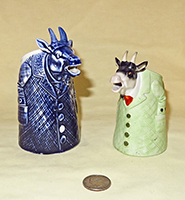 S&V goats come in two forms as well as a range of sizes and colors. I'm sure I don't (yet) have anywhere near all of them. My wife bought me my first one - the natty chap in the middle of the left hand picture - in St Petersburg, FL way back in 1991. This is actually what started me on deciding to add the non-cow S&V creamers to thge collection. Turns out that somewhat later she did tyhe same thing with suiteki, sor which I am also grateful. 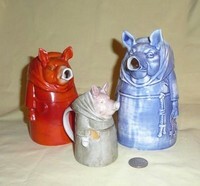 Pigs seem to come in only a single style – the Monk with cowl, keys, and ladle - but as with their other animal creamers, in a range of colors and sizes. This pig came to me from Manchester England, and the seller said he got it from a dealer in Scotland. At first I was quite excited because it’s of thicker and heavier porcelain than all the other S&V animal creamers, and has a rim around the back opening as well as an unglazed rim on a recessed, glazed bottom. It does bear the S&V mark (partial) as well as a mold number, so I thought for sure it must be one of theirs, revealing a different manufacturing technique. But it turns out, NOT SO! Sometime later I saw what looked like an S&V creamer offered on eBay with a cautionary note to buyers that it was a reproduction. The seller pointed to the www.keralouve.com web site, of the Mundial Company. of Belgium. 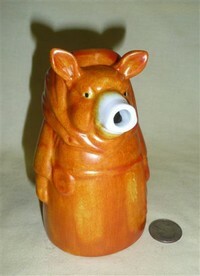 So I there and sure enough – among a lot of other reproductions of many different makers, was this pig. These folks only sell to vendors, so apparently feel they can pass off their products and let others take the hit for falsifying origin. As noted above, all the S&V molds had been destroyed by the East Germans. Turns out this pig is a recast - the thickness comes from their having used an original to create a new mold . Coloration, glaze, etc. also differ from the original. Seems I now have to be more careful when acquiring S&V (and other older) items, particularly because I’ve noticed these types of reproductions showing up on eBay more frequently. Whether the chap in Manchester or the person he got it from in Scotland knew it was a reproduction I have no way of knowing - but having been fooled once (to the tune of £62) I will now be more careful, and take advantage of eBay’s buyer protection policy should I get ‘bit’ again. I guess I was wrong about there being only one stype of pig. Many years later I encountered another pig monk that bears a faint S&V mark – very different from the interpretation shown above, and the only one of this mold that I have ever seen. I was, and remain, a bit skeptical about this one’s provenance albeit the bisque and mark match those on known S&V creamers. I checked the www.keralouve.com site mentioned above, but it’s not there, so if this is indeed a reproduction, it’s someone else’s. At least it wasn’t very expensive, so it was well worth taking the chance. Here is a family of bears in various sizes and colors. They are a good example of the quality of these early humorous S&V animal creamers and make a nice display so we put them on our mantle. Dapper monkeys on their way to court a lady also come in a range of sizes and colors. Like the other S&V animal creamers, geese (does one say Mother Geese or Mother Gooses?) come in a variety of sizes and colors. The one on the right is 6 1/2" tall, and came well after her smaller cousins which is why she is all alone. It turns out that the Mother Goose theme is sufficiently popular that it has not only been copied, but supplemented, by other makers. Here is the S&V small goose in the middle, surrounded by a gentleman with a lid (if S&V made one I've nevber found it) and a lady that is unmistakably a copy of the S&V one. I normally would have passed them up, but wanted to find out who made the ones that are so similar to S&V. It turns out that they aren’t even German, but rather bear the mark of “The Horchow Collection”, as well as “Made in England”. Naturally I dashed to Wikipedia, finding that “Samuel Roger Horchow (born July 3, 1928 in Cincinnati, Ohio) is a catalog entrepreneur and Broadway producer…In 1971, Horchow started The Horchow Collection, the first luxury mail-order catalog that was not preceded by a brick-and-mortar presence. He sold the Horchow Collection to Neiman Marcus in 1988.” Horchow has produced quite a numberv of successful Broadway plays, and is the author of three books. I wonder if he realizes that somewhere along the line he (or maybe Nieman Marcus?) copied S&V? I was very pleased to acquire this mule, via ebay…first I’ve seen, and I wasn’t aware that they made one. He must be fairly rare, because the bidding was quite furious. Probably could have bought a live donkey or 3 for what I ended up paying. Now of course I’ll be looking to see what he might look like in a colored version. Before leaving Germany, I should mention Royal Bayreuth. The Royal Bayreuth porcelain factory was established in Tettau in 1794, and is the oldest privately owned Bavarian china firm. Since they’ve been making very high quality porcelain for over 200 years there are thousands of pieces and a very active collector’s club, see www.royalbayreuth.org. 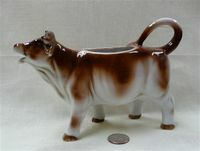 I’m not aware that they ever made any full-bodied cow creamers, but they have produced a line of cow , water buffalo, and bull head pitchers, like the ones shown here. There are more examples in the Heads theme. Tom Hatton. Also from the US, and both designed and made here, are these whimsical cows from the studio of Tom Hatton, dated (l-r) 1994, 91, and 93. His studio is located in Bonita, CA…On his web site, http://www.tomhattonceramics.com/, his wife Diane tells us a bit about him: “Tom was born in Hawaii in 1944 to a Portuguese mother and a farm boy father from Georgia. Growing up barefoot on the beaches of Waikiki was an idyllic beginning followed by a year on the farm where he developed a passion for grits and huge hogs. He grew up in San Diego and attended San Diego State College receiving first his BA and then his MA in sculpture with a master's show featuring among other things, the Bank of America on the back of a pig. (It was during the Vietnam War.) He married me, Diane Chase, and taught art classes part-time at San Diego State and the various local junior colleges. We had two children, Carlson and Alana, and I taught elementary school. In 1983, we were introduced to the American Craft Council shows and Tom found a ready audience for his work in galleries and stores across the country. While it forced him to be a little more commercial than he would have liked, it served us well, enabling us to work together and put the children through school. In 1995, we chose to let the people who had worked for us, seven of them at the busiest, go on to other things and we pared the line down so that Tom was not doing so much repetition and more one-of-a-kind work. It is still exciting and he's always working on something new. He still never talks about what he is making and it is always a surprise when I see a completed work. It's fun.” You can see more of Tom’s cow pieces on the Teapots page. Here is another of Hatton’s cows – this one is dated ’88, and marked A/P for Artist’s Proof. The lady from whom I acquired it stated that she bought it directly from Tom’s wife Diane when she was cleaning out his workshop. I believe it is one-of-a-kind, and comes from when he was developing his approach to cows, finally settling on the style of the ones above. For those of you that appreciate his work, check out his teapot and matching sugar and creamers on that page. Next are a number of other designed-in-the-US and produced overseas examples. 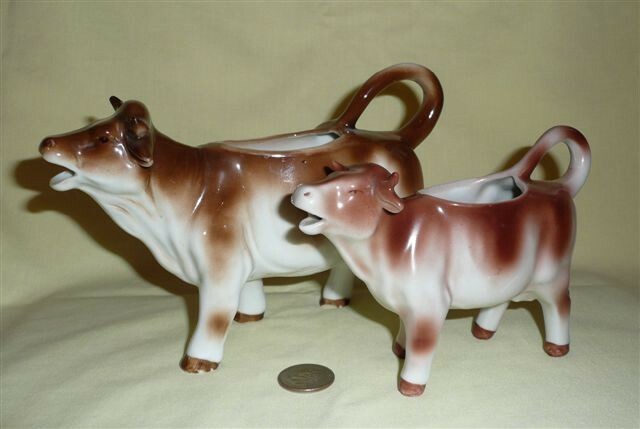 Here are two neat old cow sugar and creamers. The set on the left is from The Holt-Howard Company of Stamford, Connecticut, an importer that was started in 1948 by John and Robert Howard and A. Grant Holt. They focused on whimsical kitchen items and giftware, and are probably best known for their ‘pixiware’. They were bought out by General Housewares Corporation in 1969, but the HH name was apparently retained until production ceased in 1990. 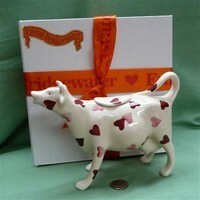 See, e.g., http://www.collectics.com/education_pixieware.html. Pixiware was so popular that other companies started to copy it. One of these companies was Lipper & Mann, who are responsible for the funny cow set on the right. According to the web site for Lipper International – Lipper bought out Mann in 1963 and changed the name – they were organized in 1946 on 5th Ave, NY, as an importer of glass and ceramics from Czechoslovakia and other European companies. They started importing from Japan in 1947, which is where these (and the teapot set shown in that section) came from. Mr Lipper passed on in 2002 but the company is still going strong, now as a wholesaler of wooden items and, among other things, ‘Lipperware’. Otagiri Manufacturing Company, more commonly called OMC, was based out of San Francisco and its products were (originally) manufactured in Japan. Around the 1960s, a very similar company called Jard Products arose that had the same designs and even nearly identical stickers. In the mid-1990s, Otagiri was sold to Enesco Corporation. Otagiri, like Fitz and Floyd, seems to have periods when cows are a popular theme. From http://collectibles.about.com, I learned that “George Zoltan Lefton was a Hungarian immigrant who arrived in Chicago in 1939. Although his background was in marketing and designing specialty clothing, he had a passion for collecting fine porcelain. The Lefton Company was founded in 1941 … he traveled to Japan in 1945 to seal an importing agreement and the first Lefton China product marked "Made in Occupied Japan" reached the United States in 1946… The Lefton Company was purchased by OMT Enterprises in 2005 and moved to California”. 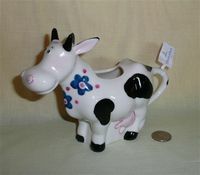 Lefton made cups, pitchers, etc in this cow-shaped form, and they not only were popular themselves, but have been quite widely copied. There are a number of examples elsewhere in the collection. 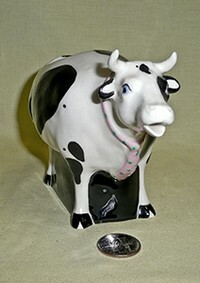 Mary's Moo Moos were created by artist and designer Mary Rhyner-Nadig. 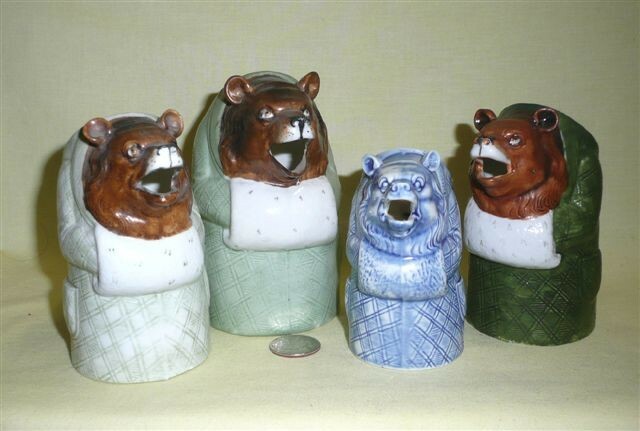 They are one of the many collectible product lines of Enesco, a producer of giftware and home and garden décor products, based in Itasca, IL. 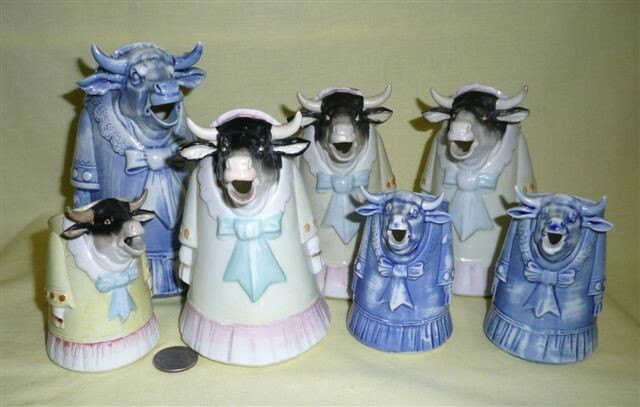 Moo Moos seem to be quite popular, and there are a number of collectors clubs. Most of them are figurines, but there are (at least) these two that fit my collection, a creamer (albeit the cow itself is not the creamer) and this teapot, ©1993. Fine dinnerware china companies get into the cow-act as well. 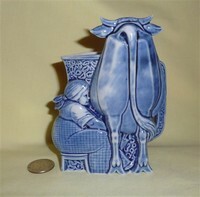 Here are Lenox's “French Country Cow” set and “Poppies on Blue” calf creamer. They've also made a Christmas cow. The Lenox Corporation web site has a nice ‘about us’ section that tells a lot about its proud history. It starts: “In 1889, founder Walter Scott Lenox had the confidence and passion to pursue his vision of creating "the finest American porcelain dinnerware" with a start-up company that operated for several years on a shoestring budget. In the early years, his persistence and determination led to the company's success. Demand for his unique and artistic American porcelain products steadily grew and, 125 years later, the Lenox brand continues to be the most trusted tabletop name in the U.S. market. Today, our bone china is still manufactured in the U.S., at our Kinston, North Carolina facility.” While many potteries have changed hands or closed over the years, Lenox is not only a survivor but a gobbler with an apparently huge appetite. These days, The Lenox Corporation includes among its brands Dansk, Gorham, Reed & Barton, Kate Spade New York and The French Chefs as well as Lenox. Next, here are a few of my favorite modern English brands. First, a couple fancy cows from Royale Stratford. 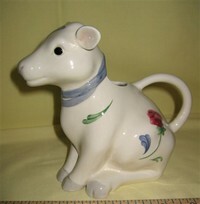 They had a reputation as one of England’s finest makers of bone china, but ceased production in November 2005. These specialty cveramic, porcelain and china companies seem to all be disappearing or being absorbed. This teapot and creamer are marked for Moorland, Staffordshire, Chelsea Works, Burslem. This pottery studio was started by the Hungarian Joseph Szeiler in Staffordshire in 1951. His Burslem factory opened in 1955. After his death it was taken over and renamed Moorland (after the address) in the mid-1980s. Here are a creamer and teapot from Price & Kensington Potteries, another of the famous Stoke on Trent factories; they’re now part of the Rayware Group. 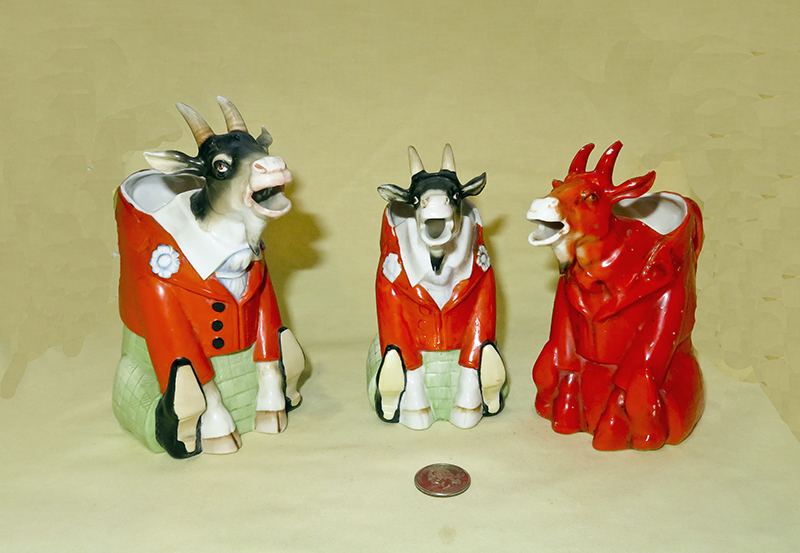 These three are humorous ‘take-offs’ on the cow creamer by Beswick, a famous maker of high quality figurines. 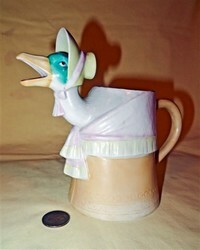 From www.myantiquemall.com, I learned that “J. 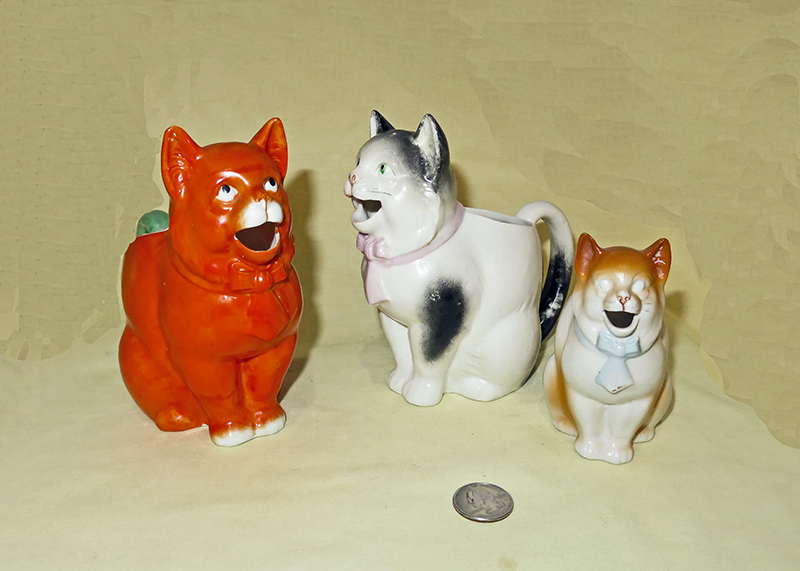 Beswick (pronounced BESS-wik) started his Staffordshire pottery around 1894 making dinnerware and such ornamental ceramics as the then ubiquitous Staffordshire cats and dogs. 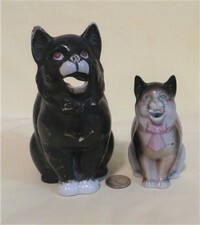 Most were unmarked and are hard to tell from their competitors’.” In 1934 descendents John Ewart and Gilbert Beswick introduced high fired bone china figurines of “unmatched quality and detail” first featuring animals in humorous settings, and then under ceramicist Arthur Gredington they started using named breed champions as models. Their champion horses, dogs, and cows were very famous and popular (and expensive). In 1969, having run out of heirs to run the firm, the family sold out to Royal Doulton. I’m sure that there is a story to accompany these ‘creamers’; they are actually ‘models’ or satires of creamers, and have no mouth holes. They were designed by Graham Tongue, and were made from 1982-89, Model #2792. The one with the yellow flowers seems to be the most common, but as seen here there are also blue and purple versions (and maybe more??). The Emma Bridgewater line of china includes cow creamers in several of their patterns. They have recently been reintroduced, presumably in time for Christmas ’07 shopping, albeit they bear (for some reason that truly puzzles me) a warning that they are not intended for food use. Given their price (£50 from their web site!) this seems truly strange and inappropriate. Be that as it may, I of course needed one of each pattern that they make…they’re on page 3 of Modern Variations, along with a couple collector’s versions. “Kent” cow creamers bearing the knot logo, like the ones on the right and center in this photo, date from 1944-1962 (when the factory stopped making them) and were produced from 19th century molds. The Museum of Pottery and Art in Stoke on Trent (home of the fabulous Keiller collection of Staffordshire cow creamers) has reproduced some in various colors (with the knot logo) for sale exclusively at their gift shop; the creamer with the green country scene on the left is one of those. William Kent initially established his factory in Burselm in 1878, and produced ‘Old Staffordshire’ style pottery from even older molds. The early Kent versions, as well as those that predate his operation or have been reproduced more recently, are unmarked. They come in a wide range of colors and decorations, both on bases and free standing. All however have lids. 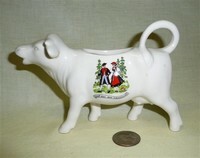 See Jim Hurford’s website http://www.ling.ed.ac.uk/~jim/ for some examples of older ‘Kent’ type creamers in the Staffordshire theme. To conclude this page, here is one last favorite European company. 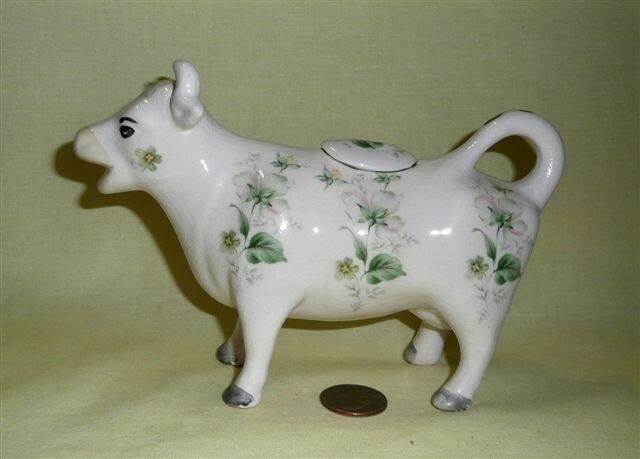 This is Villeroy & Boch’s “Happy Farm” cow, the only modern one that they have made as far as I know. . Wikipedia tells us that the company that because V&B “began in the tiny Lorraine village of Audun le Tiche, where the iron master François Boch set up a pottery company with his three sons in 1748. In 1766 Boch was licensed to build a ceramics kilnworks nearby at Septfontaines, Luxembourg, where it operated a porcelain factory. In 1785 Nicolas Villeroy became sole owner of the faience manufactory at Wallerfangen. In 1812 Jean-François Boch began construction of kilns at the nearby town of Mettlach, Saarland. In 1824 Boch commenced transfer printing on porcelain from engraved copper plates. On 14 April 1836, the Jean François Boch company merged with that of the competitor, Nicolas Villeroy, and became Villeroy & Boch, (V&B, also simply 'VB'). Since 1869, when Villeroy & Boch opened the first manufactory specializing in architectural tiles, the company has operated in three main areas, autonomous until 1982, tablewares, tiles for flooring and revetments, and fine plumbing fixtures…The company's Luxembourg factory was closed down in 2010. While the company is no longer run by a family member, under the present Group Chairman Frank Goering, there are various family members currently working in the company. Since 1990 the company… has been listed on the German stock market but the voting capital is still in the hands of the family descendants.” These days V&B is worldwide but has its broadest market in Germany. For a detailed history of its founding and development over the past 250 plus years, go to www.villeroyboch-group.com/en/company/our-stories/history.html. 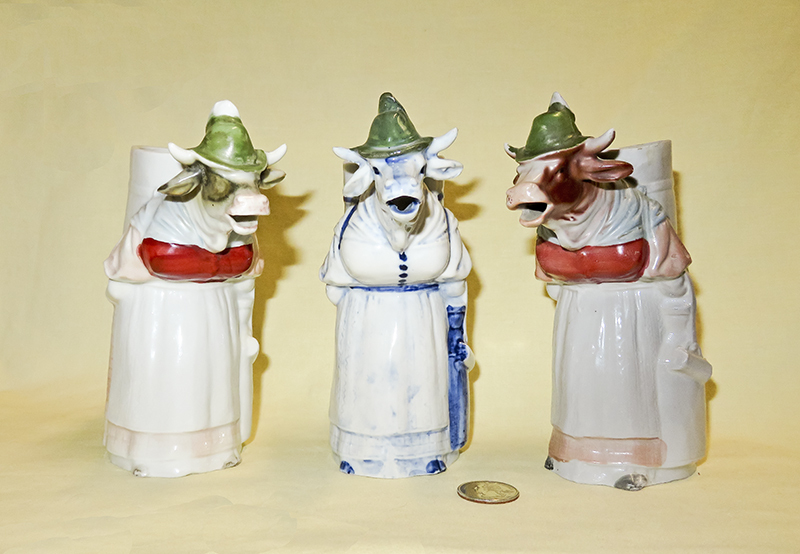 I have a four lovely souvenir cow creamers made by V&B in Luxembourg, presumably in early 20c, that are shown on the Advertising And Souvenirs page.